It didn't come as any surprise that Liberté, Egalité, Fraternité, one of the gardens at the Chaumont International Garden Festival, was designed by a pair of Englishmen. The joke translates well into French though, and I could hear that the French family near us were amused. 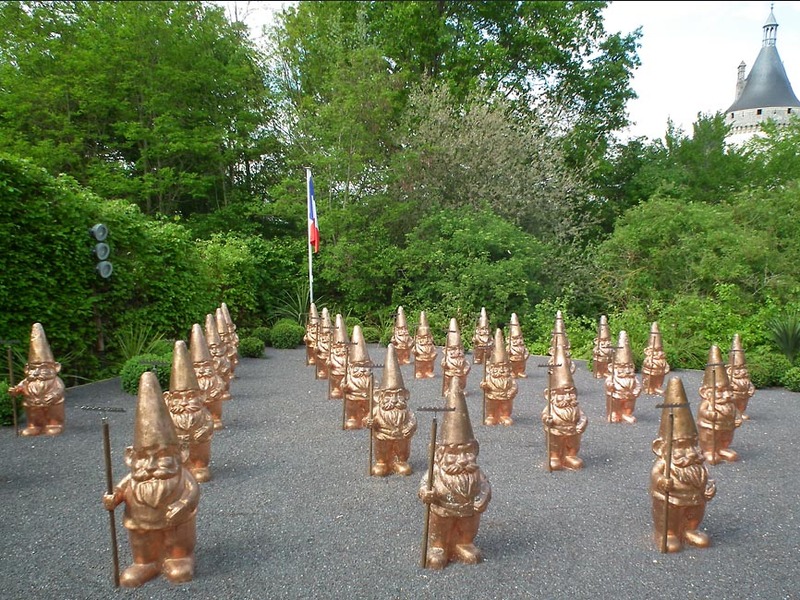 Read the designers' blurb if you want to know the full details of the gnomes' manifesto. 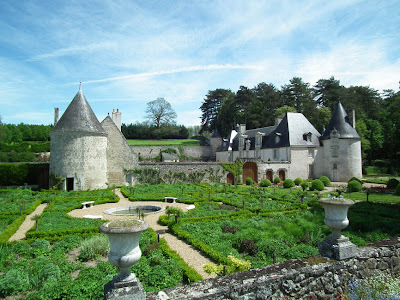 We visited Chenonceau with some clients the day after Ascension Day, which this year fell on the 17th of May. 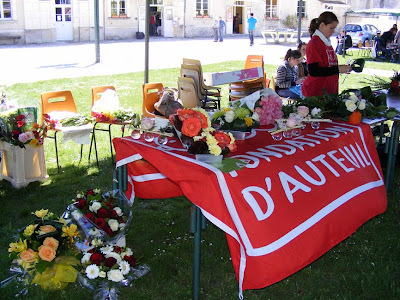 Ascension Day is on the Thursday 40 days after easter Sunday, and people "faire le pont" - that is "make the bridge" and take an extra long long-weekend by adding the Friday. The weather was perfect: not a cloud in the sky, and we had partaken of a particularly good lunch. 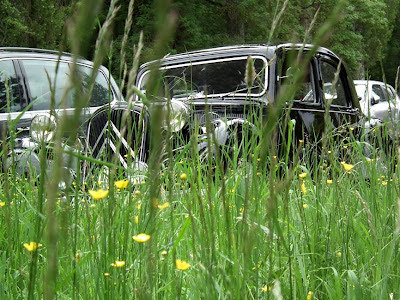 Our previous visit to Chenonceau had been two days earlier - the day before Ascension - and they were mowing the horse paddock next to the car park. This wasn't surprising, as the horses were struggling to keep the grass under control. What I hadn't realised is that they were mowing the paddock so that they could turn it into an overflow carpark, which is where we ended up. When we were at Chenonceau in August last year we agreed it was a bunfight, and you would REALLY have to want to see Chenonceau to brave the crowds, but Friday the 18th May was even more seriously crowded. I would never say to people "don't go to Chenonceau" - it's an icon, and a deserving one at that. 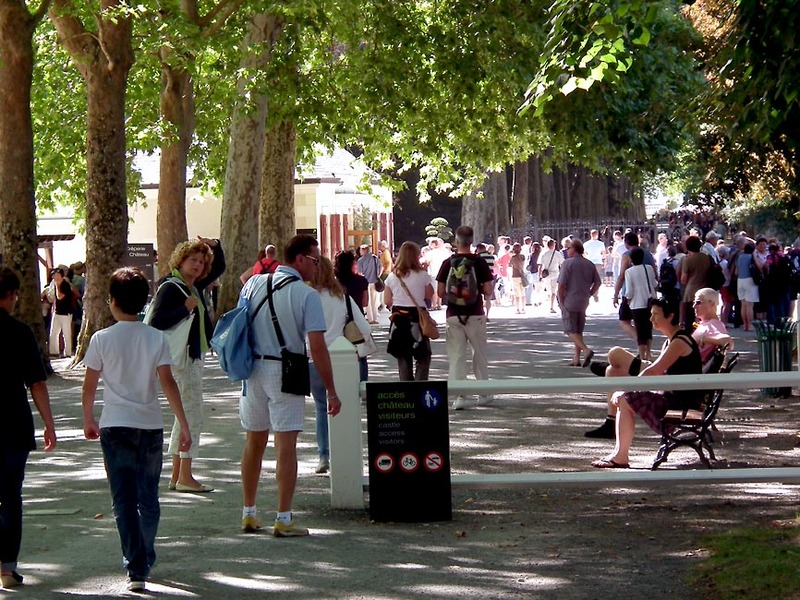 I would, however, say "avoid Chenonceau on a public holiday if you can". Detail of the back garden. 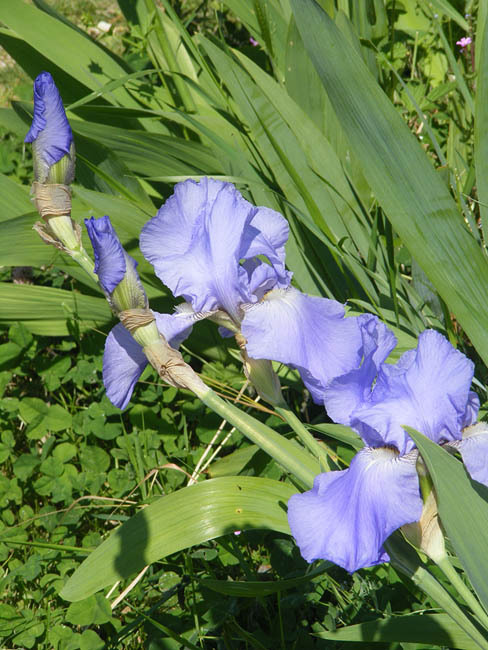 Long term readers will remember the heart rending tale of Steve the Siberian Iris. He and Son of Steve were separated in the great move to France, with Son of Steve coming to Preuilly in the first round. Steve got to languish back in London until Simon could return with a van to pick up the rest of the plants. Sadly, Son of Steve failed to thrive in France and died quite soon after our arrival. Steve, on the other hand, has reliably delivered several deep purple blue flowers each year at this time. a photo of Steve and now he has finished. Steve is now joined by some pale lavender tall bearded iris and some slightly different Siberians . The bearded rhizomes were given to me when we built our back garden terrace and I planted them along the bottom to disguise the concrete blocks. I was warned they would be bog standard, but I didn't mind what they turned out to be, because I have never met an iris I didn't like. They have flowered for the first time this year and are putting on a lovely show for beginners. Bearded iris (rescued from a garden renovation). We've spent last week with visitors. My sister Kathy and brother-in-law John made a very welcome stop on their European holiday. They've visited before, when the house was still like camping, and got to sleep on an airbed in the pantry. Nowadays we can proudly offer them a comfortable bedroom with adjoining shower room. Naturally it was a full programme of nature and cultural heritage. 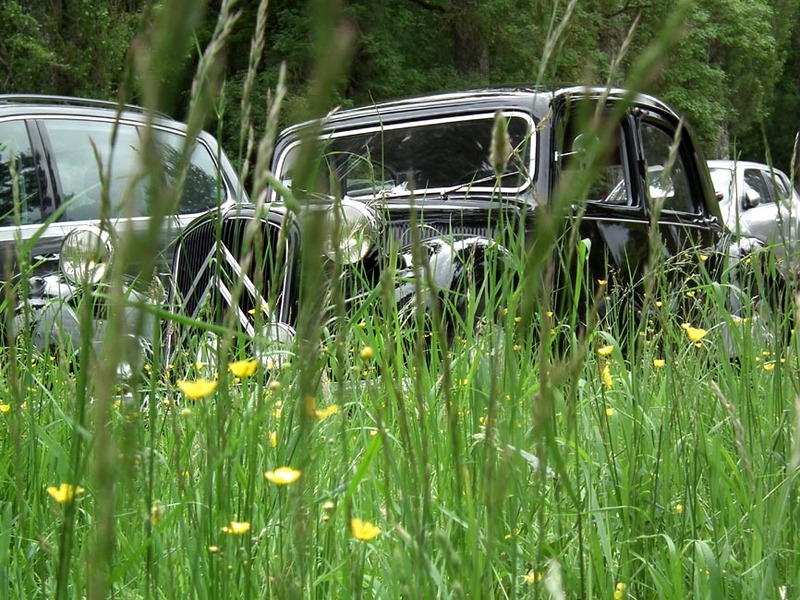 They had a hire car so on days when I needed to catch up on admin or gardening, they went off to visit chateaux. But we also had several days out looking at wildlife in general. They are keen birdwatchers, but I am only a casual birder, so the birdwatching was a bit disappointing because I didn't know all the good spots and can't identify LBJs in the tops of trees by their song. Botanically there was lots to see and the butterflies and dragonflies were quite good. 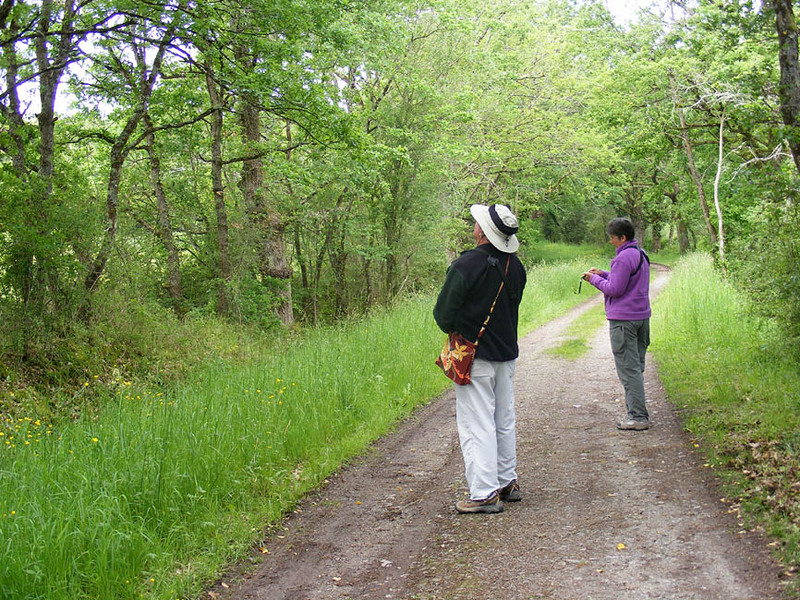 Kathy was using a new iPhone app for European butterflies which she found very helpful and generally easy to use. 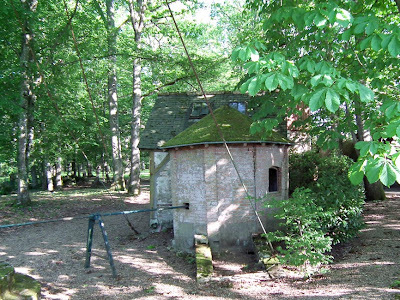 Maison du Parc in the Brenne. On Monday we began by going to the supermarket - a top destination for any tourist in a foreign country in my opinion. John is coeliac so menu planning for the week needed a bit of thought. (You can read his post about travelling in France here). SuperU is not very good for gluten free products, but I made some bread for him using one of Andrew Whitley's recipes from Bread Matters. I like experimenting with different flours, and gluten free ingredients such as chestnut and buckwheat flours are easily available in French supermarkets, so I had these on hand already. 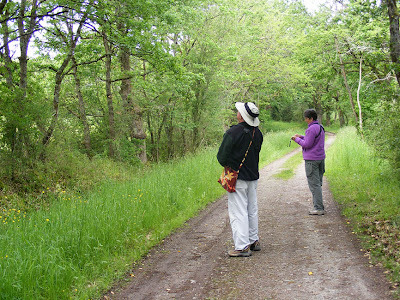 Tuesday I had clients for an orchid walk, kindly referred to me by Sue of La Confiance gites. 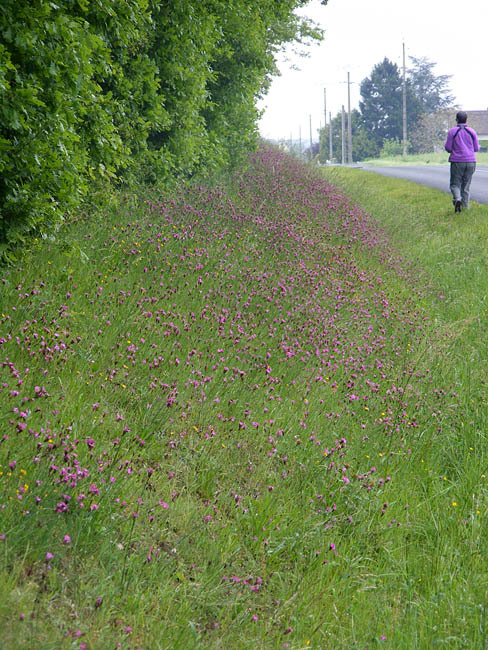 They were happy to have K&J tag along, and as a bonus I took everyone to a roadside site which is a mass of Carthusian Pinks at the moment, along with quite a few other plants of interest. John and Kathy birdwatching in the Brenne. 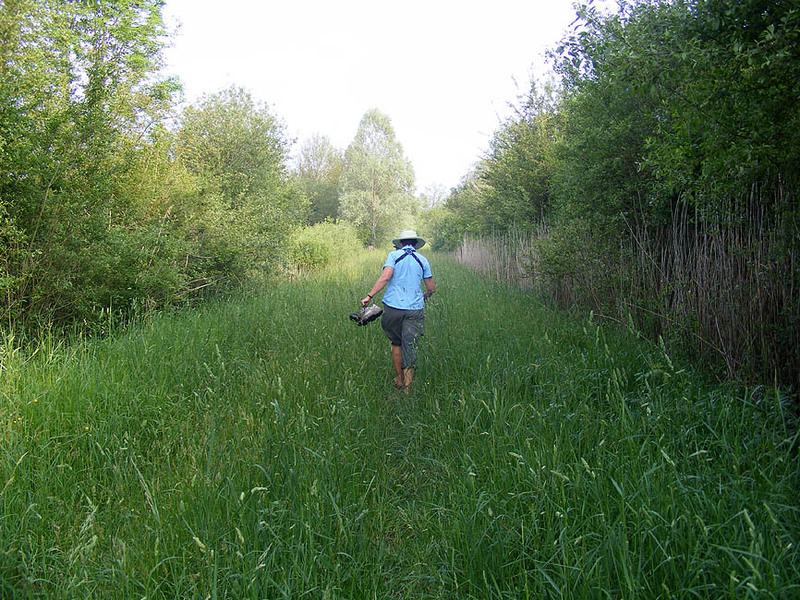 Wednesday was full on nature and we went to the Brenne. This area is one of the most important wetlands in France and becoming increasing popular with birdwatchers in particular. Preuilly is only just outside the Brenne, so it was an easy outing for us. At the Maison du Parc there was a Black-crowned Night Heron on the pond, Orioles in the trees and good views of Nightingales singing. Moving on to the Etang de la Mer Rouge, just round the corner from the visitor centre, we had the best of both worlds, with the lake on one side and oak woodland on the other. 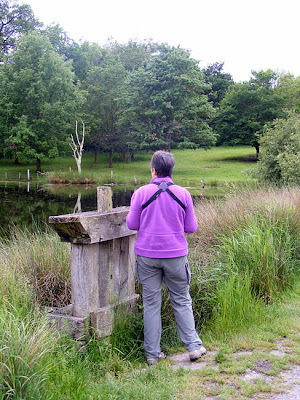 After backtracking for a nice lunch in the café we spent the afternoon concentrating on orchids - first at Rosnay common, and then at the Etang Vieux near Saulnay. Kathy wading through the swamp at the Etang Vieux. 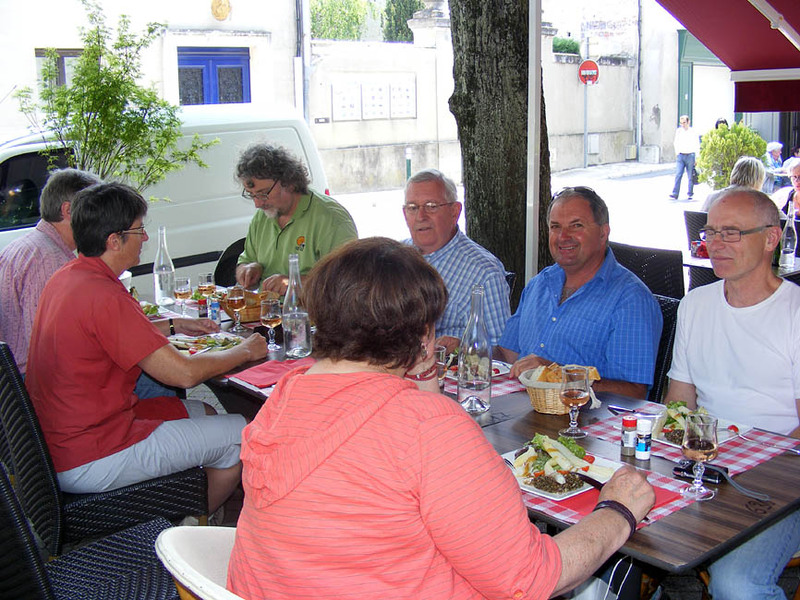 On Thursday we went up to Montrichard for lunch with Ken and Walt and Leon and Sue at La Villa (Ken wrote about it here). On the way we stopped off at Montpoupon and after a thoroughly convivial lunch we headed for Chenonceau and later Chateau Gaudrelle. Chenonceau was remarkably crowd free, especially compared to the week before, which was a public holiday, when it was packed to overflowing. At Chateau Gaudrelle John was able to talk technical with the winemakers, so even though he is a non-wine drinker he enjoyed the visit too. Kathy tried a range of wine and opted to buy a couple of bottles of the Réserve Personnelle, a very well balanced sweet white wine. This time she will be sure to put it in her hold luggage, after having the bottle of sherry she bought us in Spain confiscated at the airport! Friday I had various domestic tasks to get done so they went off to visit Fontevraud, Villandry and La Chatonniere on their own. They came back very impressed by Fontevraud and by the Orangerie there, who had gluten free bread and made John a very nice sandwich. They admired Villandry, but were disappointed by La Chatonniere, which they said was looking rather unkempt. 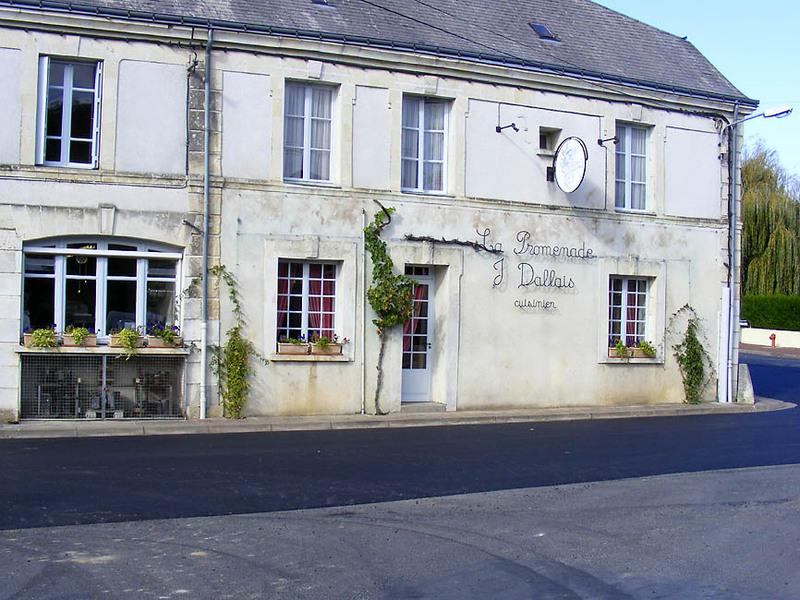 In the evening they took us to Jacky Dallais' La Promenade Michelin starred restaurant in nearby Le Petit-Pressigny. The staff there were reassuringly professional about John's dietary requirements and we had a jolly good time. Xavier, the sommelier, was chatty and the food was beautifully presented and very tasty. It is also incredibly good value and not in the least intimidating. If you want to try a truly 'fine dining' experience, this is definitely the place to go around here. On Saturday, after spending the morning in the Foret de Preuilly, we joined my local botany club for an outing to look at the orchids around Chaumussay (last year's outing report here). It was extremely hot, and many of our local orchids like open roadsides or limestone ridges, so we wore hats, sunscreen, sunglasses and stood around in the limited shade as much as possible. I tried to translate Marc Fleury's little lecture on each of the 18 species of orchids we saw and the day ended with several mugs of his home made cider. Since cider is John's drink of choice, this went down very well and they were impressed with how good it was. 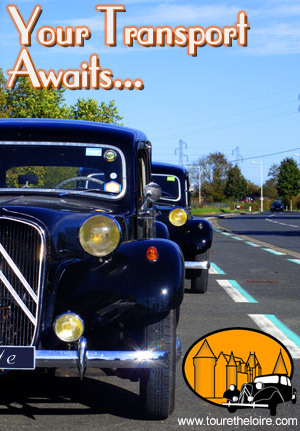 On Sunday we waved them off on their way to Lyon for a few days, then they fly home back to the Canberra ratrace. We have seen some pretty savagely pruned lime (linden) trees in the past (and Susan has written about it), but these trees in Montrésor really do take the cake. I looked to see if we have any photos of these trees pre-pruning, but we only have bits of them - they did tend to get into every photo taken, but not in their entirety. A miraculous biblical miracle, manna is the name given to a natural phenomenon in France involving some species of mayfly. 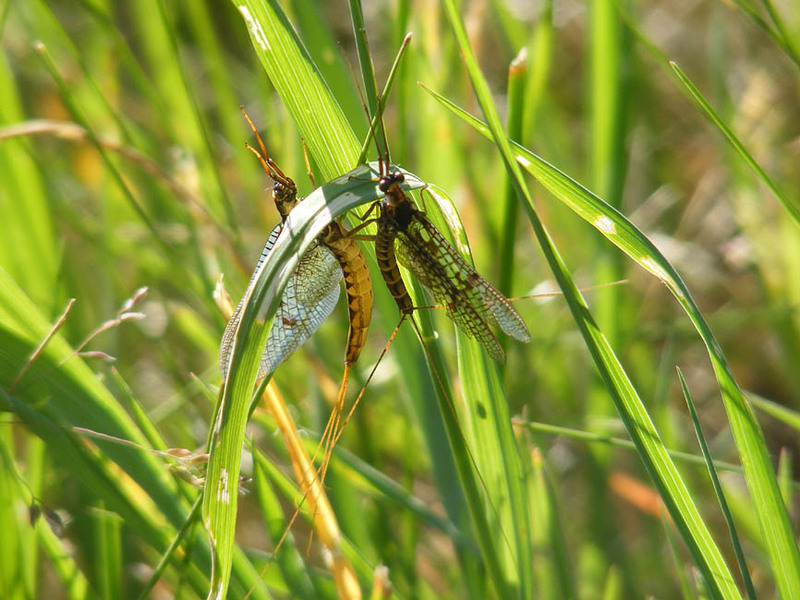 Mostly known as a source of bait for fishing, mayflies emerge in great numbers and in some areas are harvested by local residents. 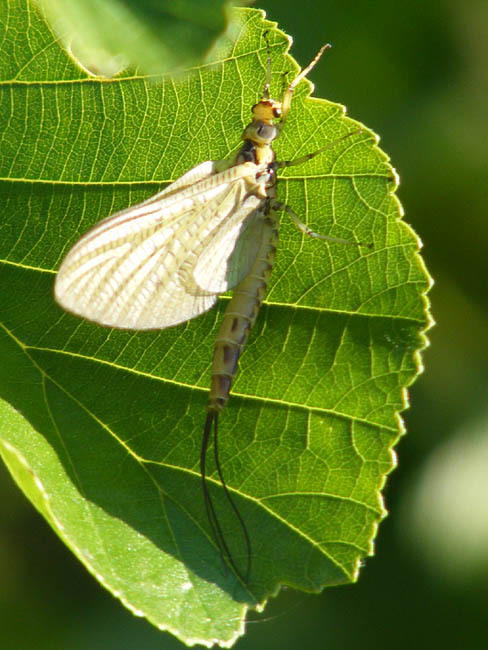 Before the species involved (mainly the small white Ephoron virgo) became rare, manne blanche was the bodies of mayflies full of eggs, highly nutritious and a real delicacy for domestic fowl. 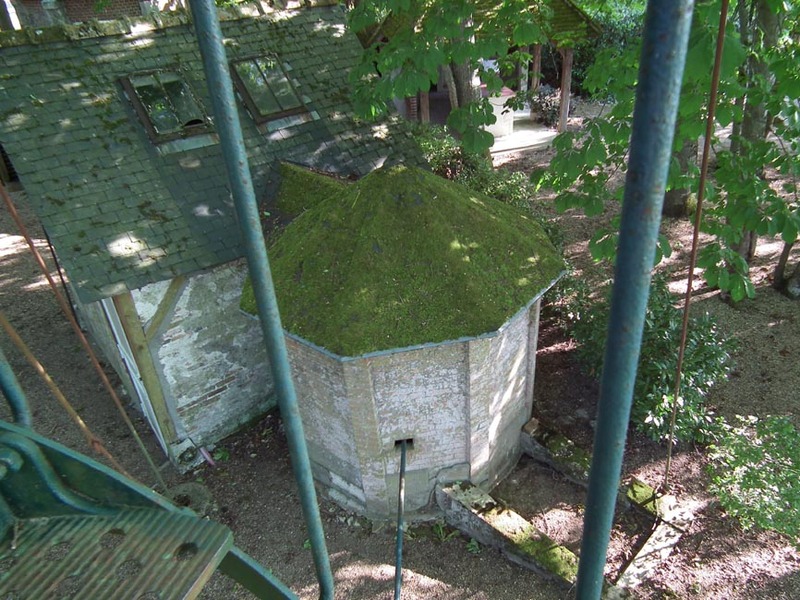 It became the hub of a cottage industry harvesting the mayflies for raising poultry and game birds. The emergence of the manne is spectacular. Principally associated with the big lowland rivers, the mayflies synchronise their emergences, so that massive numbers appear over a very short period, generally in the evening for a few days in the summer. Their aim is to mate and lay eggs, after which they quickly die, forming a filmy carpet of floating insects, sometimes several centimetres thick drifting down the river. Other, bigger, species are also known as manne and are popular with fisherman. These are primarily the big Ephemera spp, the most common of which is E. danica. The Ephemera spp emerge from May to September, peaking in late May, early June. Some years there are short spectacular episodes where there are massive numbers of adults on the rivers. 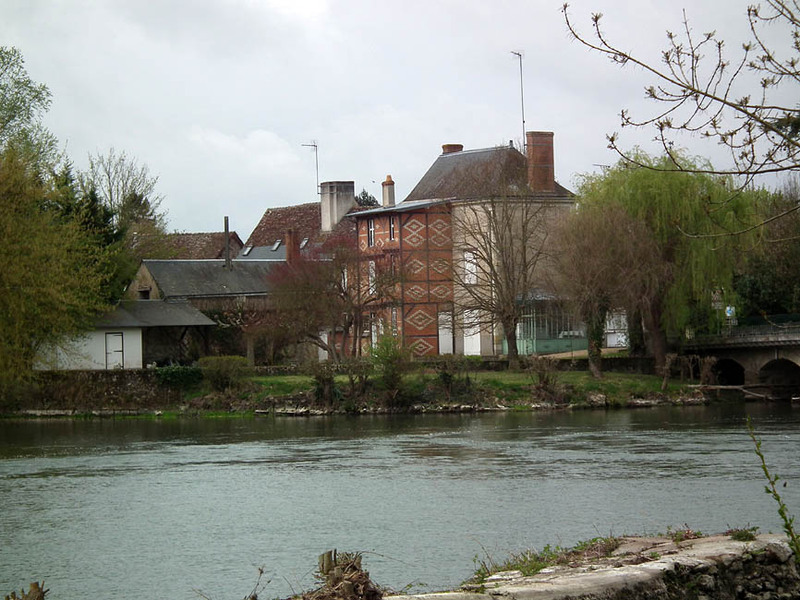 Every year, just in case, a sign is posted on the bridge across the Vienne at Bonneuil Matours warning that the road might be slippery due to a mass of fat dead mayflies. During their metamorphosis into adults they are very vulnerable to predators. Fish pursue the larvae as they mount towards the surface to transform and snap up the adults just before they make their first flight. In French the fish are engaged in gobage, a word that means crudely slurping sucking swallowing - in other words, gobbling. There is a school dining hall game here known as gobage de flamby which involves sucking out and swallowing whole the contents of a popular caramel flavoured dairy based dessert that comes in little individual pots. I think the mayfly emergence is the fishy equivalent! 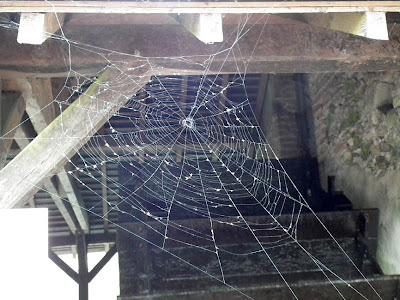 It's not just the fish enjoying the feast either - bats, dragonflies, martins, swifts and swallows, wagtails and spiders all benefit from gorging on this high calorie diet. The big Ephemera spp are relatively tolerant of organic pollutants and herbicides in the water and so most continue to thrive in rural areas. It's a different story for the smaller species, which have been badly affected in addition by high concentrations of heavy metals in the water, canalisation and controls like weirs on watercourses, and light pollution. This last can disturb females, attracting them away from the river and preventing them from laying. 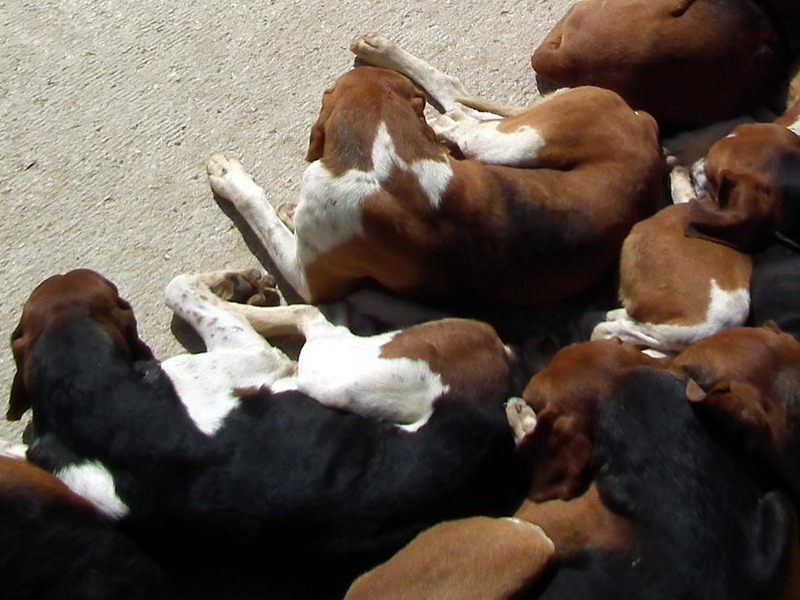 We happened to be at Cheverny last week, and the hounds were in a different enclosure, enjoying the sun. 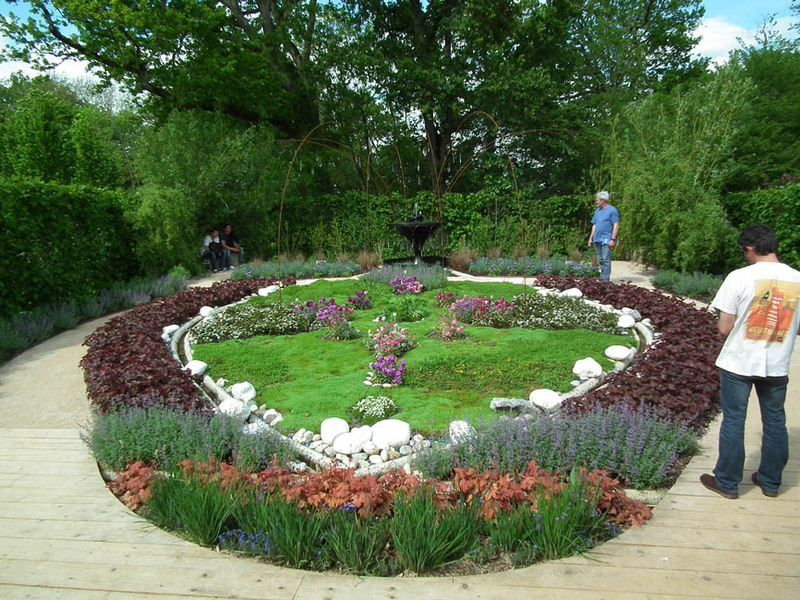 Last year, for the 2011 International Garden Festival at Chaumont, the designer Loulou de la Falaise created the Jewel Garden. 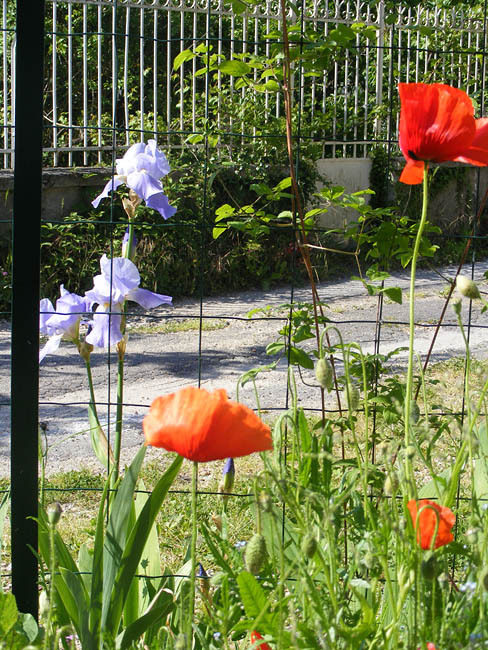 Very sadly, she died in November of that year, and as a tribute to her 'charm, elegance and unbounded imagination' the festival has decided to make her garden permanent. She was one of those wonderful people who, despite a thoroughly rackety upbringing, turn out to be free and generous of spirit, hard working, endlessly creative and completely inspirational. Personally, I am very sorry never to have met her (she was briefly married to a friend of a friend, so it is not unthinkable that I might have run into her at a party in London). For most of her working life she designed jewellery and accessories for her great friend Yves Saint-Laurent. She was enormously influential in creating the look of the 1970s, with her flair for combining old and new, haute couture with opshop* chic and always in bright cheerful colours (black was only for when you were miserable) combined with chunky clanking jewellery. The garden at Chaumont is a nice memorial to someone who was a 'compulsive' gardener. * an opshop (opportunity shop) is what Australians call a charity shop. 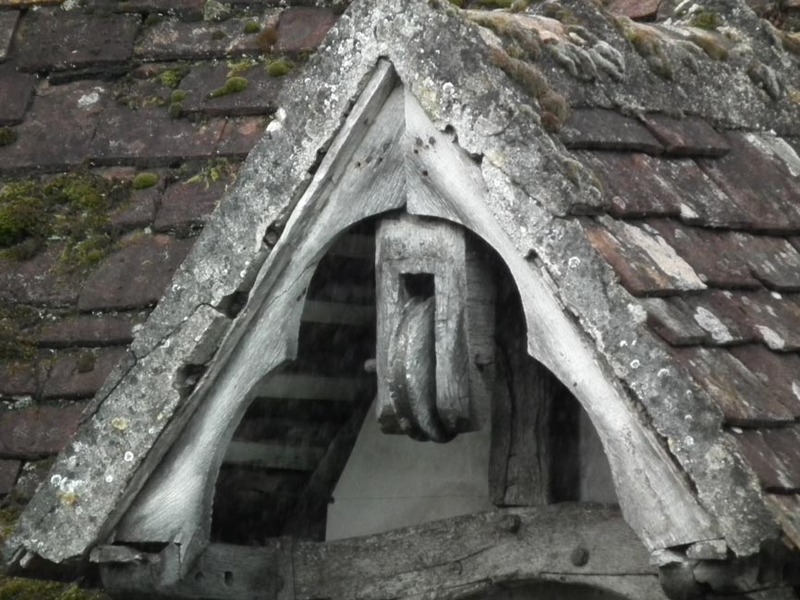 Many of the houses in French country villages have the remnants of lifting gear at the dormer window into their attic. Mostly this is just a beam sticking out above the window, sometimes with the hook for the block (pulley) in place. 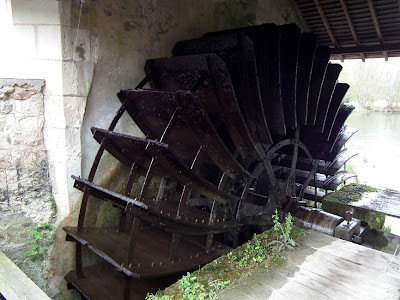 It is rare to see the actual pulley, so when I saw this one is Angles sur l'Anglin last Sunday I needed to photograph it. 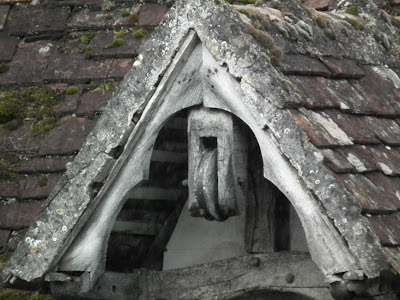 The hooks were usually used for lifting sacks of grain into the attic: attics are a good place for grain as they are usually (assuming the roof is watertight) dry places. I am sure, though, that more adventurous types have lifted furniture to the upper story and in through a window using the hooks, rather than negotiating narrow staircases. It was only 3 weeks ago we encountered our fifth Éolienne Bollée, and now we have 6. We have been really busy the past week, working for 6 days and covering over 1200km (about 700 miles) in Célestine. This has been good because it has taken us back to places we haven't been for a while, and to one or two places we haven't been to at all. 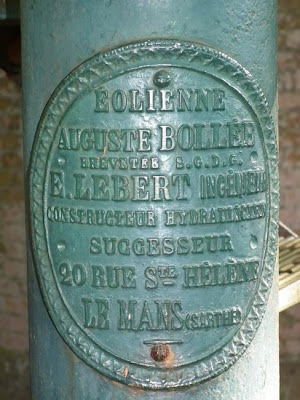 When we posted our last Éolienne Bollée I noticed that one of the hotels some of our clients use has a Bollée of its own. 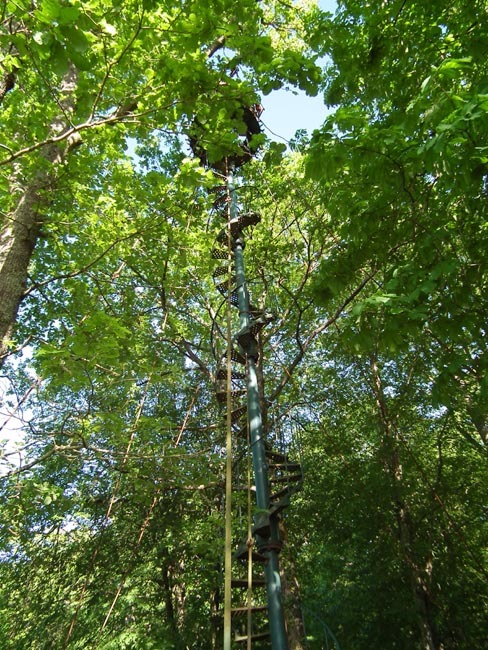 Last week we were back there so we asked at reception about the windmill, and were pointed towards a clump of trees. 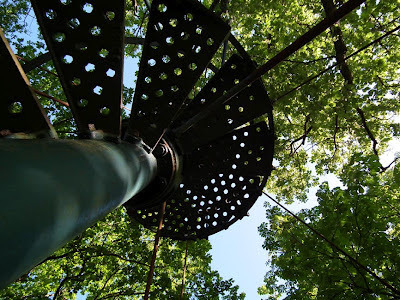 This is the first éolienne we have encountered where there was nothing to stop one climbing the stairs, so being a man of action I made a bold attempt to climb to the top. This was defeated by 51 1/2 years of common sense overcoming the urge to be a hero: the stays holding the ensemble upright weren't tight, and the swaying was becoming somewhat alarming. half way up before I marched down again. driveshaft entering on the left hand side. If you're ever in the Loire Valley and staying at Domaine des Hauts de Loire you're extremely lucky - It looks a lovely place. But do ask to see the éolienne. I have updated the éolienne map to reflect this new find. 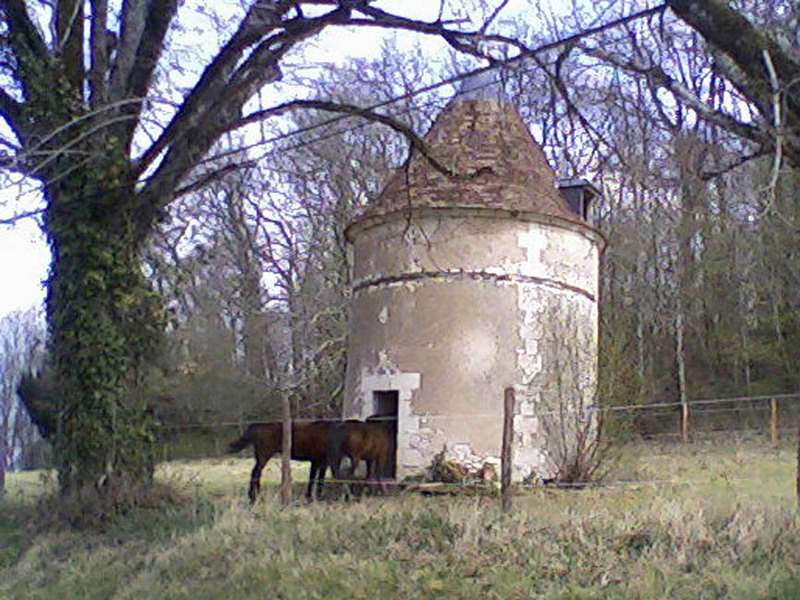 The back of the chateau. Last weekend we went to support our local disadvantaged yoof charity. They (that is the Foundation d'Auteuil) run a horticultural college in the nearby chateau of Verneuil-sur-Indre. We arrived a few minutes after they opened and by the time we got up to the greenhouse where all the bedding and vegetable seedlings were, it was packed to the gunwales. We struggled our way around, choosing little plants and putting them in our box (we brought our own boxes, as we knew they run out very quickly). On our first round we concentrated on the important stuff - vegetables - so it was zucchini, melon, tomatoes, more tomatoes, a few more tomatoes and oh, do you think that will be enough, some more tomatoes, aubergines, basil, celery, rainbow chard, but no peppers or chillies. There just weren't any to be had - we assume it has been too cold and they haven't germinated or thrived, or got knocked by the frost in March. Bridge over a stream at the back of the chateau. As ever there were many anglos at the plant fair and I got chatting to the woman behind me in the queue to pay. To my considerable surprise her French companion looked at me and said she knew me! I was the Australian woman, wasn't I, and she had run into me in the bakers at St Hippolyte!! Amongst the crowd we encountered fellow bloggers and friends Tim and Pauline and Niall and Antoinette. We had arranged to meet Annie and Chris, and they had brought their friends Howard and Elizabeth. It was all very jolly. Oh and our neighbour Pierre-Yves was there and it felt like we were stopping to chat every few metres. Students operating the sound system. Once you've chosen your plants you approach one of the students on duty, who makes a list of what you've picked up so you can take it through to a cashier. 'Our' student turned out to be almost illiterate and really struggled with finding the names of the plants and writing them down. I helped by pointing at them on his master list and he got there in the end. I thought he coped really well under pressure. It must have been very challenging to have to do something like that in public. I hope he felt proud at the end of the day of how he had acquitted himself and I hope his profs noticed he had done well. After lunch in the dining hall and collecting some seedlings that Annie had potted up for me, we came home and I got planting vegetables while Simon did window boxes. 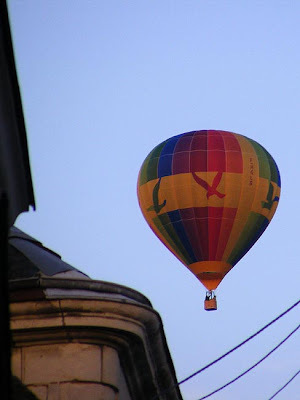 A few evenings ago I went outside to water the pot plants and heard the unmistakable whoosh of a hot air balloon gas burner. 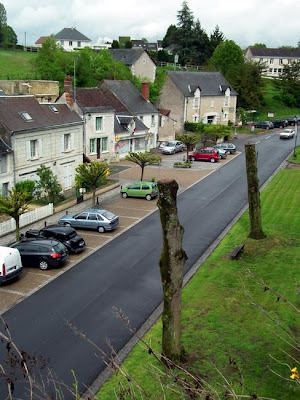 This is quite unusual in Preuilly, and at first I couldn't see it at all. It was hidden by the tall buildings in front of our house, but soon it hoved into view and I have a shot of it directly above our street. It was descending fast, so it must have come down on the high fields behind the chateau. 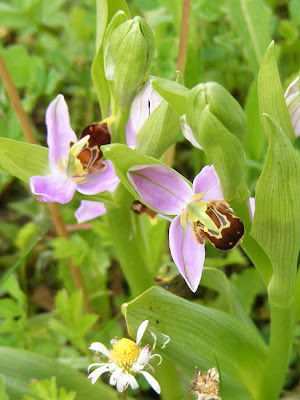 Bee Orchids in the orchard. 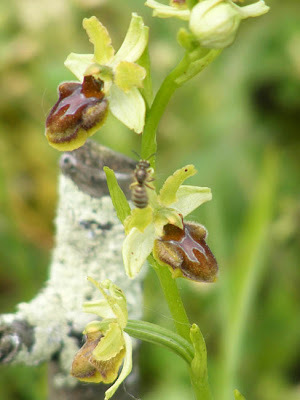 Sexual deception as a means of achieving pollinization is exclusively known from certain orchid genera. I knew, theoretically, that our orchard should be a hot bed of sexual deception, but I had never seen it in action before. Two of the species of orchids in the orchard are from the genus Ophrys. 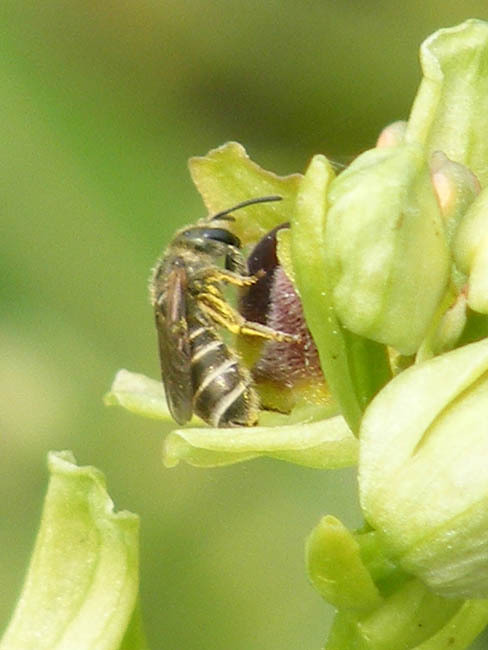 Species in this genus don't produce any nectar to attract and reward pollinating insects. Instead, the flowers have evolved to look like insects, and they exude a pheromone which tricks male bees into thinking the flowers are female bees. The male bee comes to the flower and engages in what the scientific papers refer to as pseudocopulation. 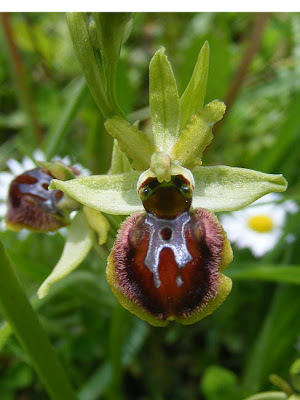 In practice, Bee Orchids, whilst they look like lovely furry bees, aren't very successful at attracting a 'mate'. Luckily for them, they are one of the few Ophrys who are not reliant on an insect partner and more often than not self-fertilize. ...where it attempts to mate with a newly opened flower. The Early Spider Orchids can also self-pollenize if really necessary, but although it is not commonly witnessed, there are significant numbers of records of Mining Bees acting as pollinators too. An Early Spider Orchid in the orchard. 'My' bee was only interested in the very newly opened flowers. Like many orchids, Early Spiders unfurl from the bud upside down and twist themselves around once fully open. The flower the bee chose was still upside down. 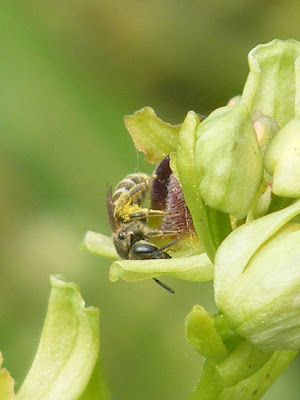 Nico Vereecken's fantastic pictures of male bees and wasps 'mating' with Ophrys spp orchids show they have two styles - head first and abdomen first. The one I watched went for both positions! unpopular Kooleen. I always had a soft spot for it. Photo by Jack Davis,1963 (used with permission). After about a week living in the boarding house in Neutral Bay, my father found us a flat (apartment) in an old brick and sandstone house in Hunters Hill, one of the more exclusive suburbs of Sydney. It consisted of 4 rooms and a shared bathroom on the upper floor of a building built as a boarding house which later became a pub known as the Gladstone Hotel. The building had once been quite grand, with wide verandas and plenty of cast iron lacework, but by the time we were living there the wooden floor of the verandah was rotting, even though the iron lacework remained. More recently the building has been restored and turned into very stylish apartments - this used to be our front room. 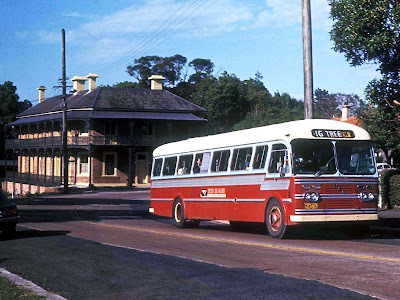 Coincidentally to our current situation, part of Hunters Hill was regarded as the French settlement of Sydney as part of the area was subdivided by a pair of brothers from Bordeaux, and many of their compatriots moved to the area. 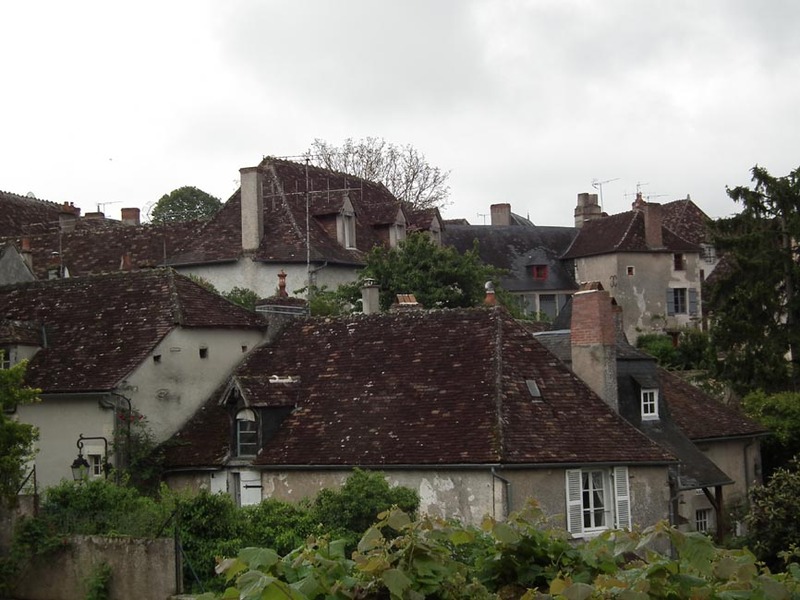 One of those was the French Consul, who lived in a building called Passy House. There is more about Hunters Hill here. A couple of days after moving to Hunters Hill I broke my arm falling of a "slippery dip" (slide) in the park opposite our house. This meant a night of pain, and the next morning a trip to Sydney city to visit outpatients at Sydney hospital. 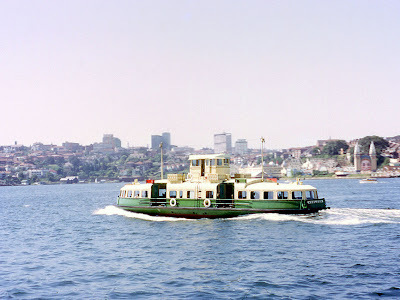 As it was a special trip we went by ferry, a mode of transport we usually didn't use because of the expense. 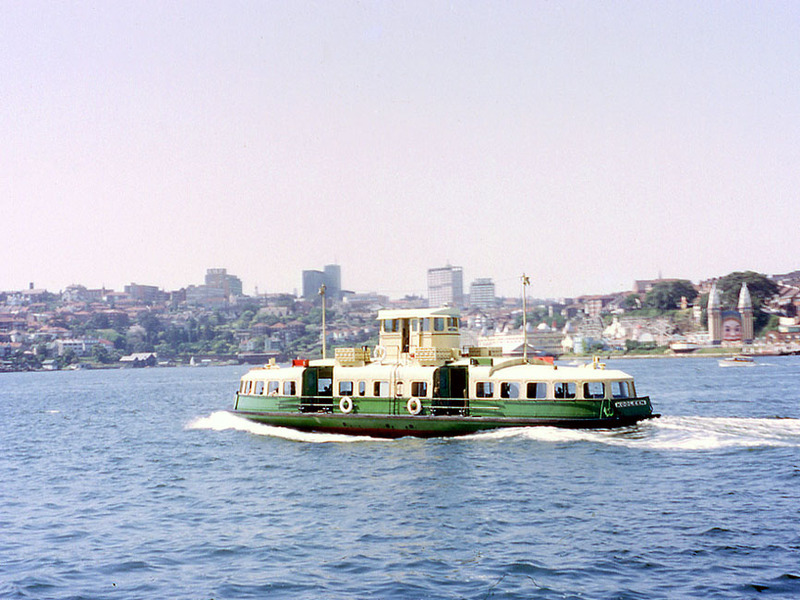 This involved catching a bus to the Valentia Street (Woolwich) wharf and one of the old "K" ferries to Circular Quay. Once at the hospital I had x-rays, and my right arm was encased in plaster. 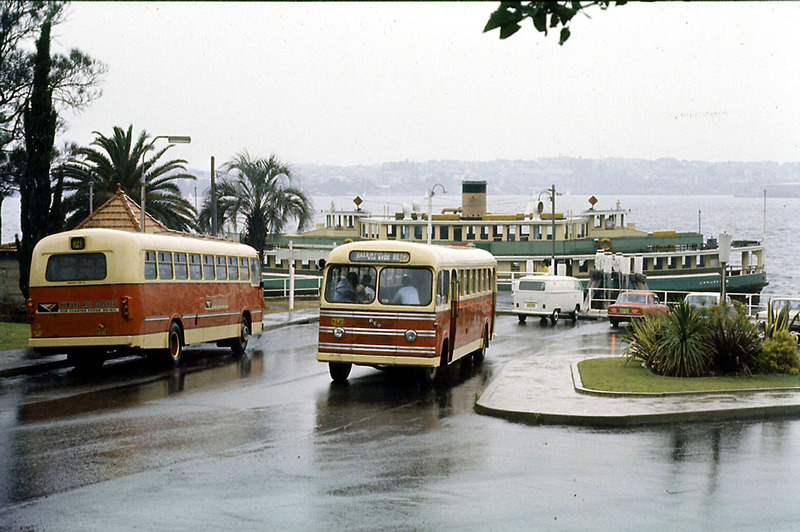 We then caught the ferry back to Hunters Hill. 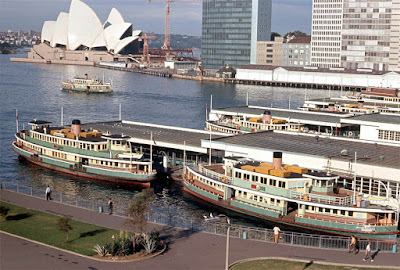 Showing how was grown up I was, I did what all adults did at that time: as the ferry arrived at the wharf I jumped ashore before the gangplank was in place. Unfortunately I landed on the plaster, and cracked it in two. 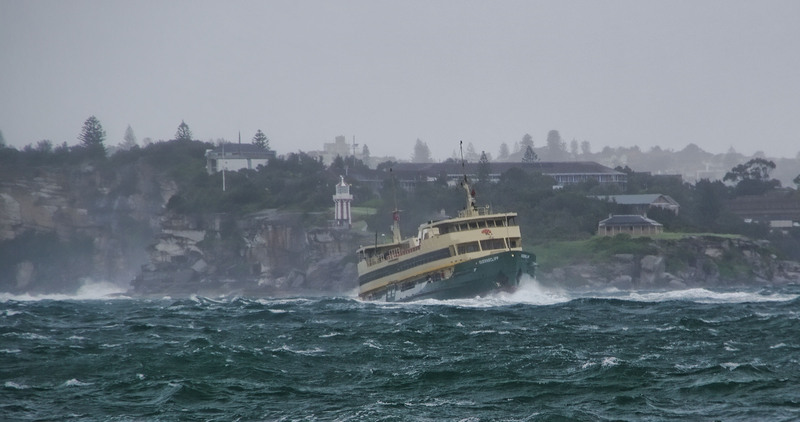 Luckily the ferry hadn't left to go back to the city, so we climbed back on and I ended up with an industrial strength plaster cast. The other events I remember vividly from our time in Sydney was being allowed to stand on the verandah to watch Apollo 7 make its way across the sky, and starting a long interest in photography by making a pinhole camera and developing the film in the bathroom with Dad. 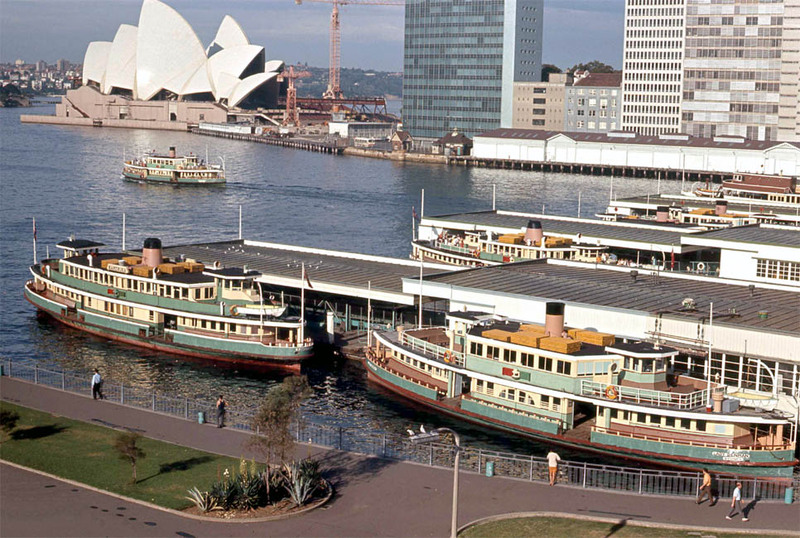 I can also remember catching the Manly Ferry on New Years Day 1968 to watch the start of the Sydney-Hobart Yacht Race and being convinced that the ferry was going to sink because it started rolling as we passed in front of Sydney Heads. (The weather wasn't this rough, but I was a London boy and no-one had warned me.) You may even be able to see me in this photo. 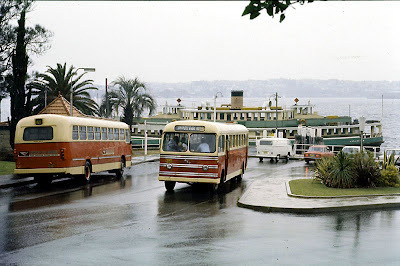 After 18 months my father found a job in Canberra and we left the life of living under Sydney Airport's flightpath for a life of complete... well - Canberra was never the most exciting of towns. None of these photos are mine - I have tried to contact the owners of the bottom two photos for permission, but not heard back. If they are your photos and you object to their use here, please contact me. 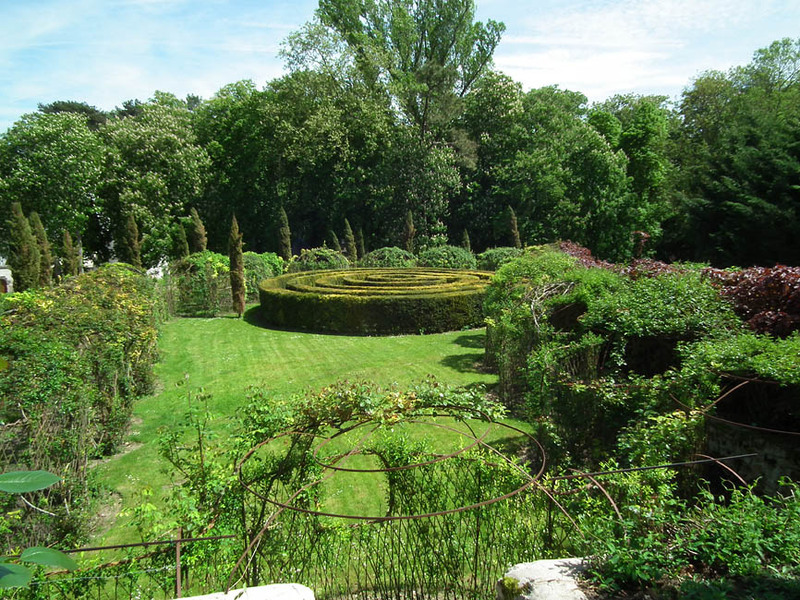 La Chatonniere is a most picturesque garden, no matter what the season. Because of its setting, nestled down in a valley all on its own, the landscape is designed to be a series of terraces, giving you magnificent views over the carefully laid out and themed gardens. but the pattern of leaves is an interesting effect. They've obviously suffered a few losses over this last cold winter, with the Italian cypresses very burnt. Mme Azéroual, the head gardener's wife, said to me that they have lost quite a few of the clematis that were planted in amongst the roses on the pergolas. Looking down on the inner terrace, full of perennials leafing up. Nevertheless, in mid May, after lots of rain, it is a sea of greens. 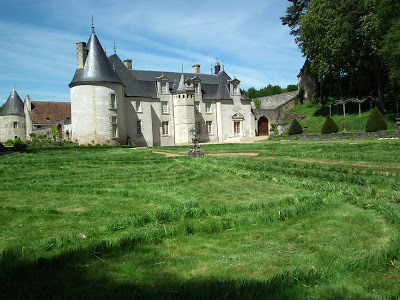 In many ways it is a more successful garden than nearby Villandry in these circumstances. Because more of the planting is permanent, it doesn't have that sense of a work in progress that Villandry can have at this time of year. 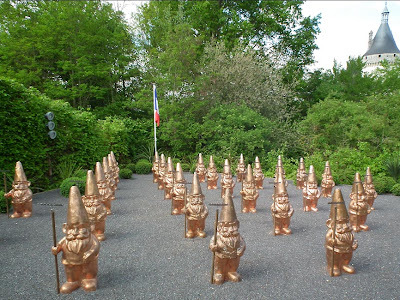 Update: Note that as of 2014, la Chatonniere is not open to individuals visiting any more. Visits must be of groups of 10 or more, on appointment only. Hay guys! Check it out! 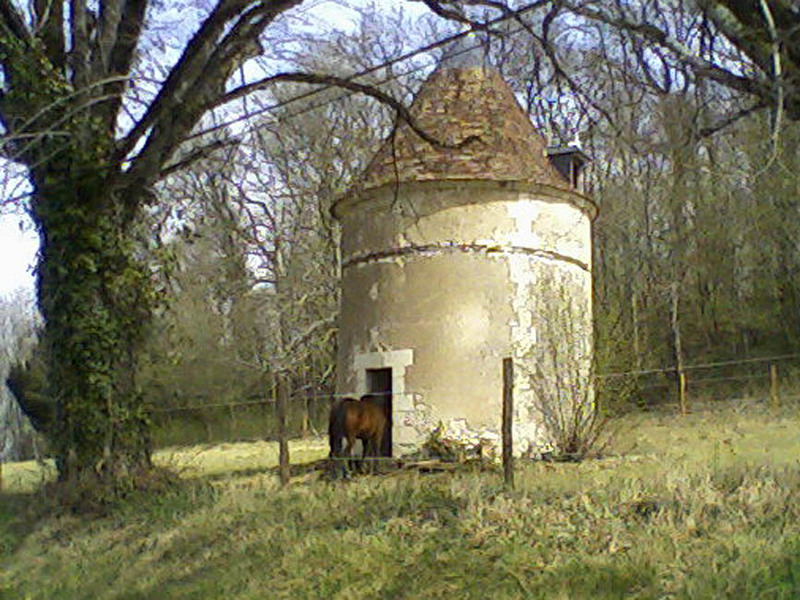 These horses, who came one by one to stand with their heads in the doorway of the pigeonnier (dovecote) at the Chateau de Boussay, amused me. 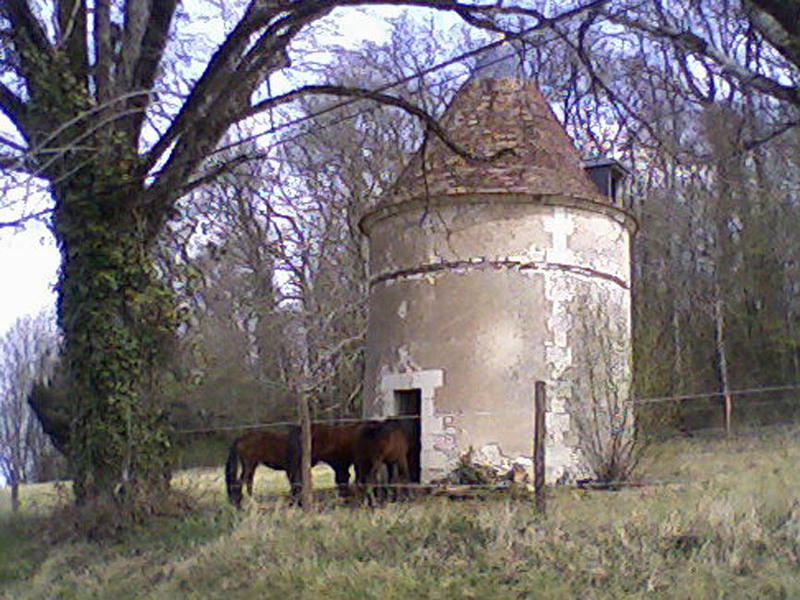 They belong either to a member of the local hunt or to a local pony trekking stable, and I doubt that there really is hay stored in there. I think they were probably standing with their heads in the dark to discourage annoying flies on their faces. If you are interested in knowing more about pigeonniers, Niall and Antoinette wrote an excellent post a while ago over on Chez Charnizay. The Black-veined White butterfly Aporia crataegi is known as le Gazé in French ('the Gossamer'). That's a much more evocative name than the matter of fact English name. Last year they had one of their periodic boom years, and you saw them often in gardens, flowery meadows and open woodland. 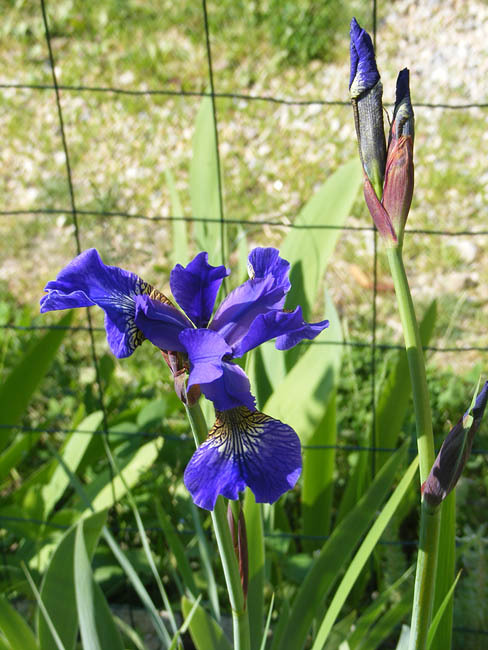 Sadly, they are extinct in Britain, and even in France, where they are still very commonly seen, they are in strong regression due to modern intensive farming methods, particularly the removal of hedgerows and the use of chemicals. 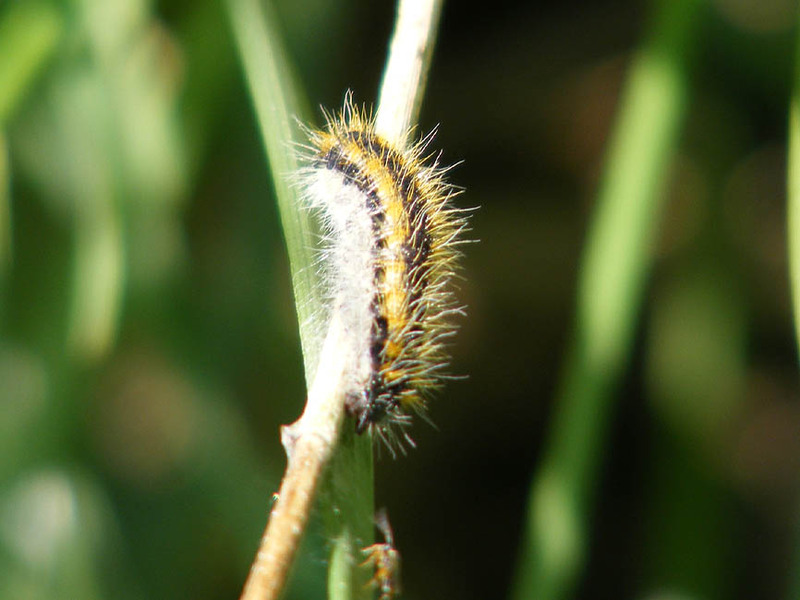 Between 1960 and 1990 the equivalent of 440 000 hectares of hedgerow were destroyed in France, and in addition, the caterpillars are very sensitive to phytosanitary treatments used to ensure crops are pest and disease free. 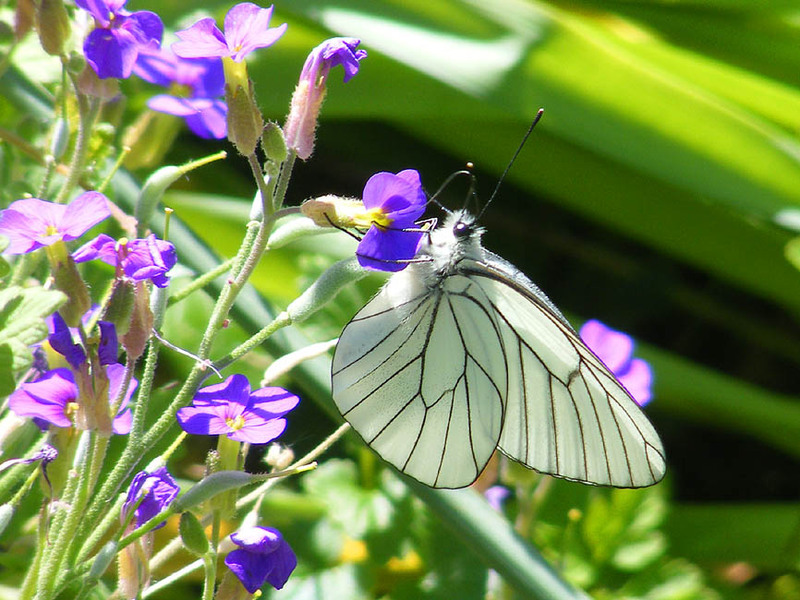 A male Black-veined White visiting a garden near Preuilly. The males are pure white with jet black veins. Females are more ivory coloured and often quite transparent. Where you see one, you are likely to see several, as they are quite gregarious. Flowering blackberry patches are always a good place to encounter them, and they will be so busy sipping nectar that they are easy to photograph. 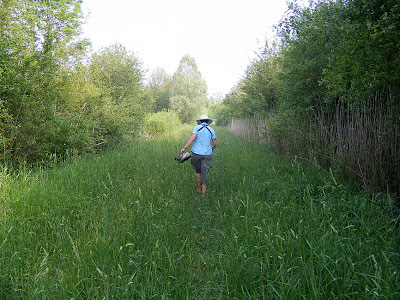 I was very pleased on my May 2011 butterfly survey to count 17 of them and see them in 6 of my 10 transects. I haven't seen any this year, but they should be on the wing any day now. One of the restored water wheels. 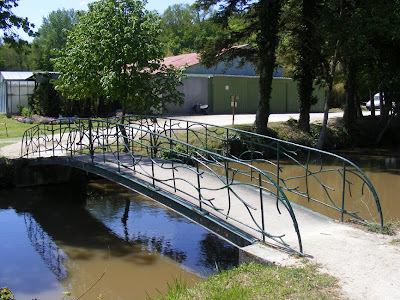 We visit Pont de Ruan frequently, as it is on one of the scenic routes that we take clients on as we wend our way to or from Azay-le-Rideau. 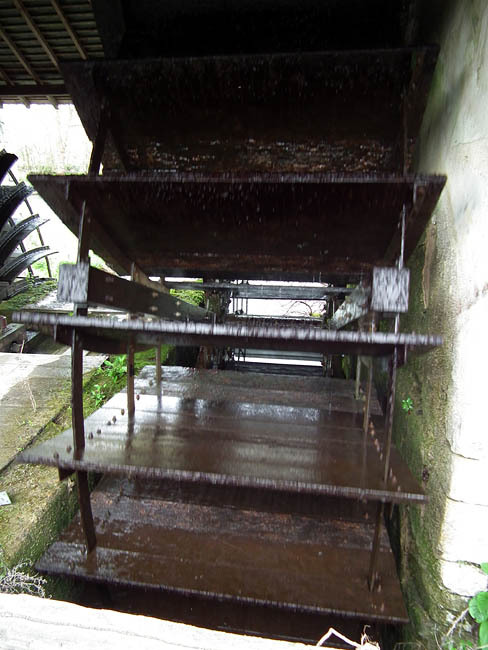 Over the last twelve months there has been a project to restore one of the mills on the Indre there and we have watched the progress with interest. Now it is virtually finished and the barriers are down. 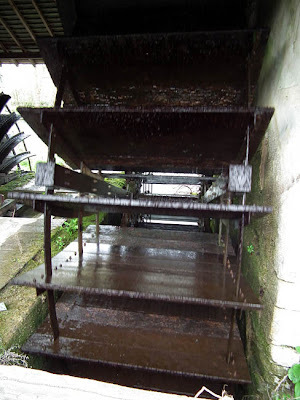 You can walk across a new passerelle to stand right in front of the pair of working water wheels. Looking straight into the wheel. It hasn't been over restored. It is such a picturesque spot we never tire of photographing it. 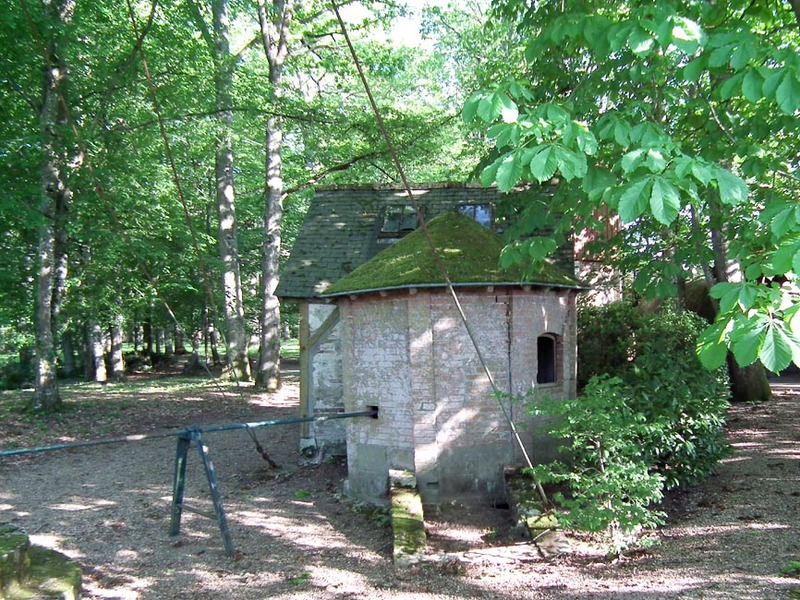 One of the other mills in the complex. The local river technician is based in the mill house and has invited me to drop in whenever we are passing. He knows our local river technician and I am always happy to do a bit of networking with the nature conservation professionals in the area. I mentioned our concerns about the over enthusiastic riverbank vegetation clearing down our way and he indicated he has similar issues up on the Indre. He didn't go into details, but it is obviously something he wants to tackle. 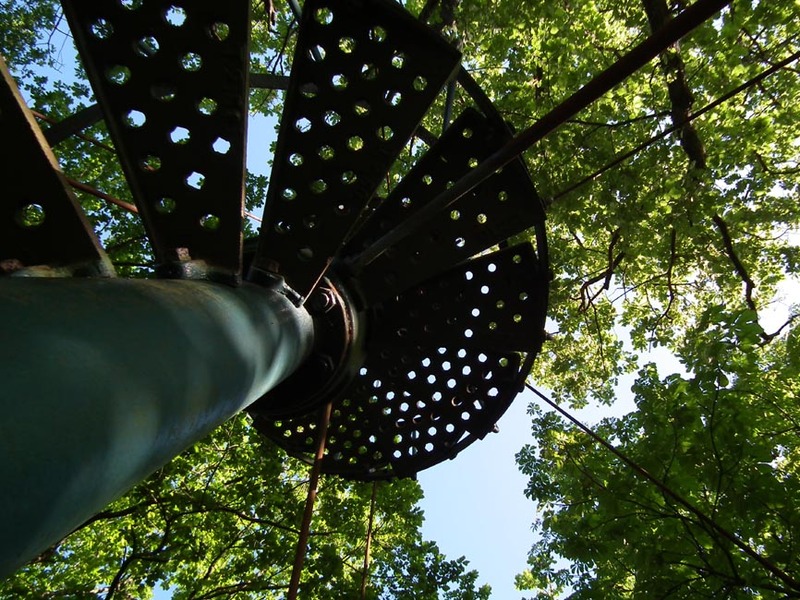 For him, the main problem is hollow trees used by bats being removed. A week or so ago there was a break in the weather just long enough for me to get some mowing done down at the orchard. On my way home I encountered this Lesser Bloody Nosed Beetle crossing the road. It was coming from the direction of the recently poisoned and ploughed haymeadow, so presumably it was a survivor of the large population of these bedstraw munching members of the leaf beetle family that used to live in the meadow. Maybe it had got sick of trying to survive on the fringes and was migrating in the hope of finding a more welcoming site. It is female, so it may have been wanting to lay eggs somewhere safe. They are flightless, so ponderously walking is their mode of travel. 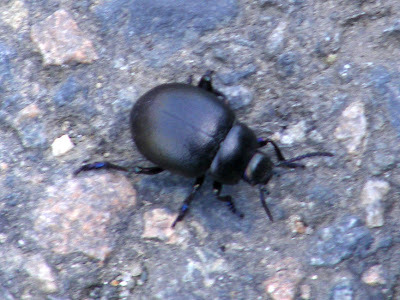 A Lesser Bloody Nosed Beetle on the move. According to a notice on the mairie notice board, there is a proposal to build a small young offenders detention centre on the former haymeadows and adjoining old furniture factory site. It is within the town boundaries, so I am sure it will result in many objections before/if it goes ahead. I just hope that if it does eventuate it turns out to be the sort of inspirational place we can all be proud of, where young people genuinely get a second chance. I was talking about it to Martin, a long time reader of our blog who we have only just met in person. He comes from a large local family (his cousin designed our staircase) and his hope is that all the wood working and furniture making skills in this town can be put to good use. 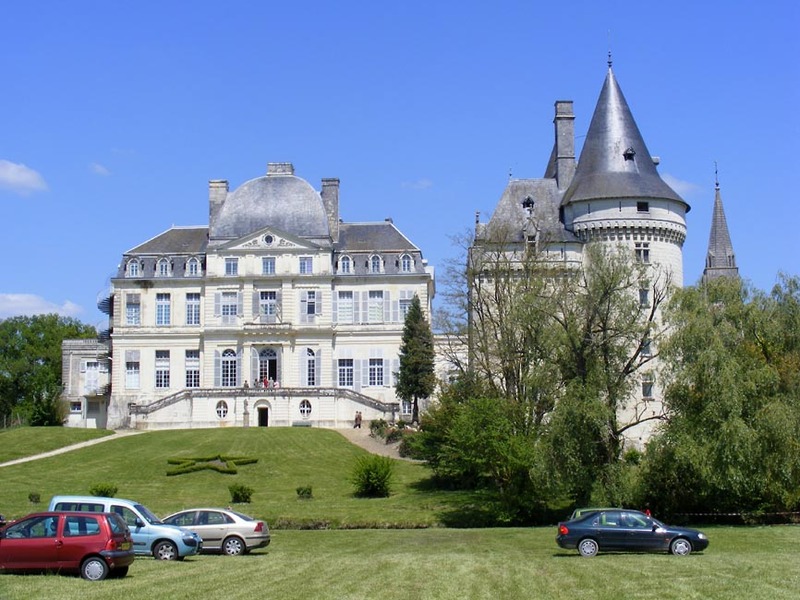 Martin's idea is that it would be nice if some sort of continuity could be maintained, by providing inter-generational mentoring and vocational training, giving the young inmates the opportunity to come out with a trade, along the lines of the horticultural training provided at the Chateau de Verneuil. 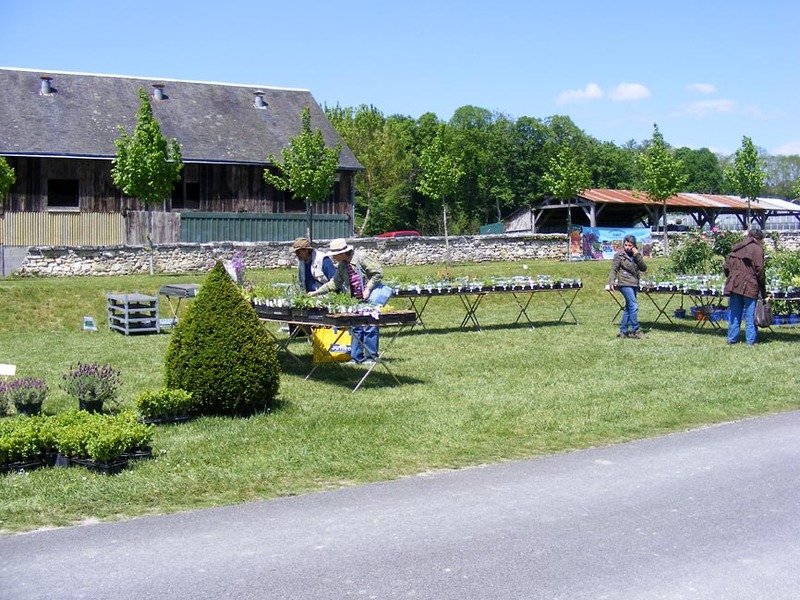 PS The annual plant fair at the Chateau de Verneuil is today. I will be there and plan on buying all my vegetable seedlings from them. If you are going to buy plants, bring a box or two to put them in - they are in very short supply otherwise. Plan to have lunch in the dining hall served by the students - it's good value and good food, and another way you can support the foundation that runs the place.